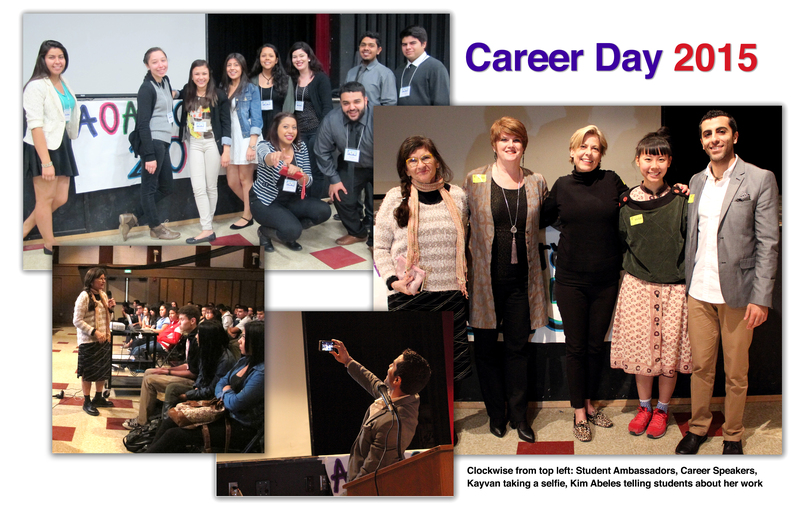 Career Day sparks student interest in the future, and brings speakers to campus to share their stories with AOAT students. This year’s dynamic presenters included Justine Limpus Parish, a fashion designer/educator, Iris Yirei Hu, a fine artist/MOCA educator, Kelley Pearce, a set decorator, Kayvan Mott, a creative director with his own design and marketing firm, and Kim Abeles, a fine artist who often does large installation projects with schools. Each had good advice for the teens, from finding your passion to not giving up, to being willing to work harder than everyone else. Students asked questions and came up to chat with the guests one-on-one afterwards. Many students asked about internships for summer. Thank-you letters are another requirement in the professional world, and every AOAT student wrote a business-style letter to one speaker. They also thanked Larry Oviatt, our Advisory Board member who heads up Career Day. Student Ambassadors welcomed the speakers to campus and escorted them to the MPR. This group of leadership students is gaining experience and confidence through interacting with AOAT guests. This past weekend our AOAT team participated in the Regional Competition for SKILLS USA – and placed! 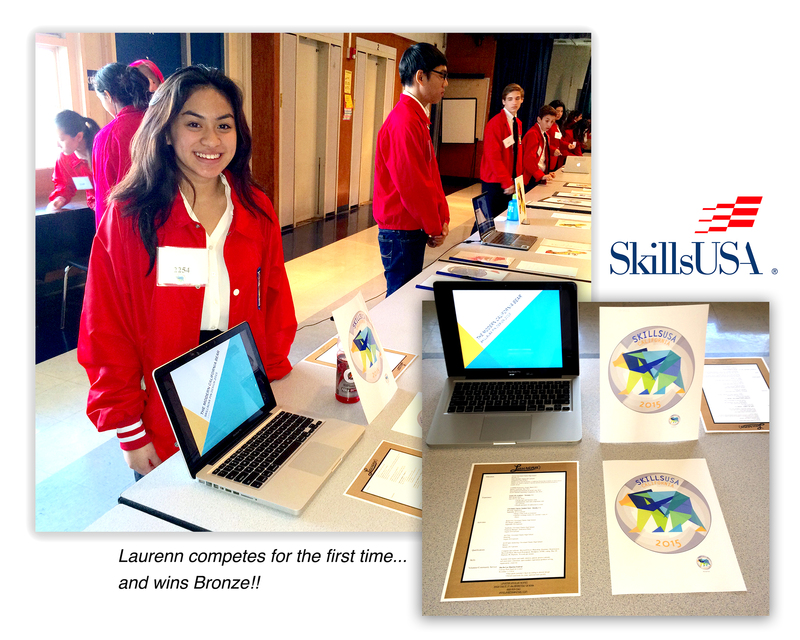 Laurenn took home the Bronze for “Pin Design”, a digital challenge requiring students to create – from start to finish – a graphic for a membership badge. This was our first time competing, so it was very exciting for the whole team. Laurenn will now move on to State competitions in San Diego. SkillsUSA is a partnership of students, teachers and industry working together to ensure America has a skilled workforce. SkillsUSA helps each student excel through educational programs, events and competitions that support career and technical education (CTE) across the nation. We have three CTE credentialed teachers in AOAT – and will be expanding our team’s participation in SKILLS competitions. We think this auspicious first experience will inspire more students to get involved, and to build their leadership abilities by competing with teams from around the region, state, and nation.